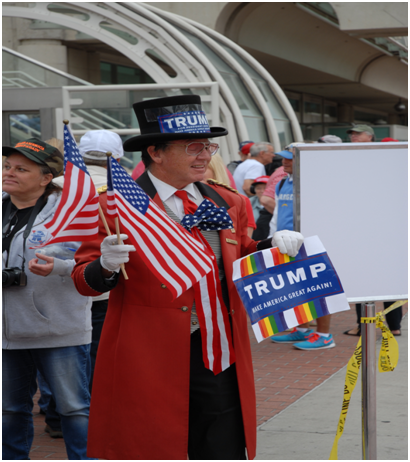 A Trump supporter in full regalia. With not much to do while waiting in line for the doors to open at 11:00AM many took time to bring attention to themselves. Like the former “Tea Party,” which the tone of this day regularly emulated, US flags and offerings of Constitutional prowess were only for show. 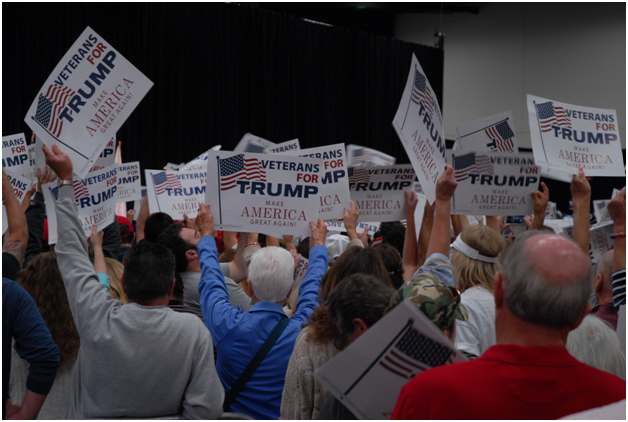 Nine of the flag waving attendees were asked to name the three branches of the US government. Score:0-9.
two hours to go and the crowd stretches on and on. The rules of engagement, except for pro-trump banners and signs and there were plenty of those. 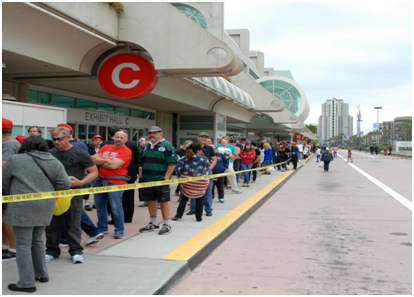 The line from much further down the Convention Center. Lots of red hats, newly purchased at the many vending opportunities. Word on the street is that Trump wears a white hat when he is happy and a red one when he is not. Lots of red hats today. 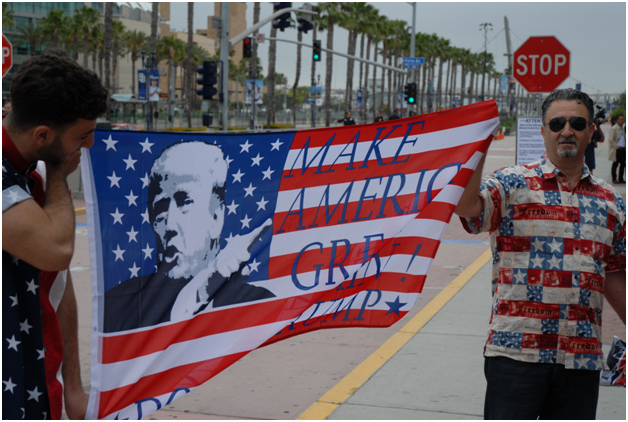 Trump-ism is capitalism and these two gents were offering their latest in flag waving. $20.00 each. When asked about their desecration of the American flag one responded, “Hey, that’s capitalism.” This may be the perfect metaphor for Trump’s campaign. Indeed there was no lack of capitalism, or pro-trump gear. Trump hats were the hot seller, followed by t-shirts. Lot of buttons, too. Most of the vendors had been traveling with the Trump campaign for weeks. Many spoke of long nights on the road trying to get to the next Trump event. 10:15AM. 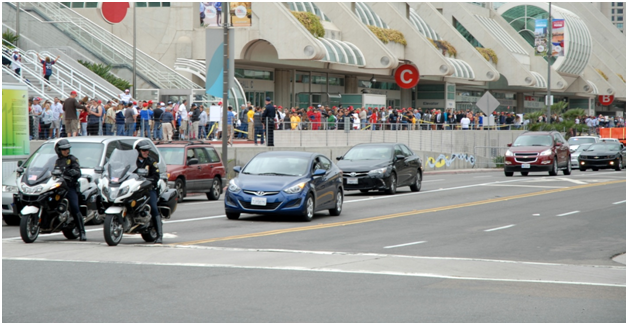 The San Diego PD begins blocking the road. The road was closed hours ago. 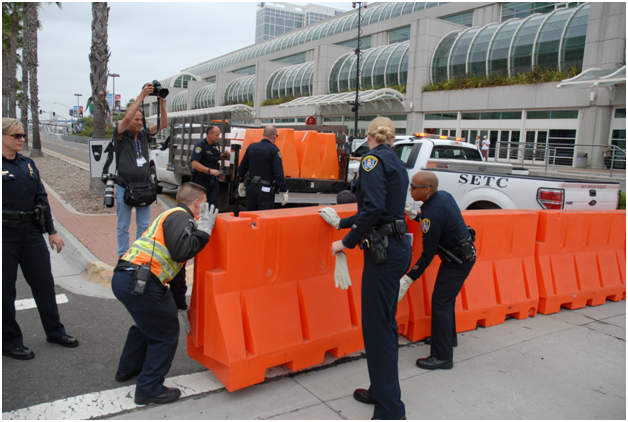 These barricades are for people. This is the roof-top of the Hard Rock cafe, located across the street. Notice the journalists. Hours later, as free speech was taking place in the “Free Speech Zone” directly below, plastic cups, water bottles, and cans of beer were thrown from this location at the protesters below. If not hypocrisy, ignorance was the call of the day. These gentlemen favored Trump because he was a successful billionaire and had created over 20,000 jobs. When challenged that Trump had not proved either point and was not releasing his tax returns, both used the claim that he was being audited and could not release them. When informed that the IRS had publicly refuted this they were surprised. Asked where they got the pro-jobs data, they replied that knowledge of Trump had come from reading his web-site. Challenged on the true objectivity of their investigation, they replied that,” Well, we like Trump.” Here lies the root of the problem. Would Trump have risen this far without ignorance? It’s past 11:00AM. The doors are open and still a steady stream of supporters is arriving.10,000 tickets were issued. 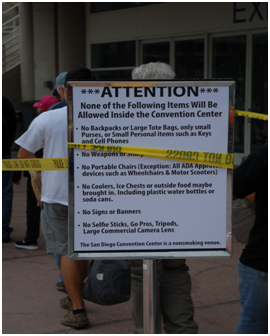 Staff indicated that, since many had shown up without tickets, approx. 1,000 more were allowed in. At the media check-in everyone was frisked. Fortunately, no one was asked to remove their belt and shoes and small bottles of liquid were allowed. One’s nether regions thankfully remained private. Trump now has Secret Service protection. Interestingly, of the many branches of local police and National Guard in attendance, it was only the Secret Service that was completely profession throughout the day. 11:35 AM- And, so it begins. The attendance for the many warm-up acts was sparse. But that would change very soon. Looking across the Convention Center floor, the crowd is getting larger. The media area. Lots of media. Lots of groans! At the official vending area business was brisk. 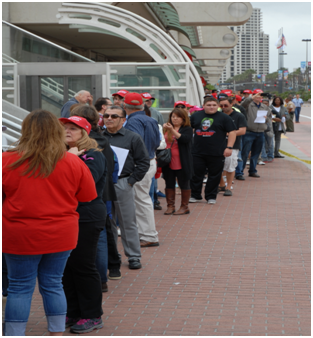 Prior to Trump taking the stage no less than one-hundred-and-fifty people were in line at all times. Red hats were the most popular. No sombreros, however, were sold at this event. The third and possibly most revealing topic for Trump was his defense of a law suit brought against him and his predatory enterprise, Trump University. Saying he was being, “railroaded by the legal system,” on-and-on he went for almost twenty minutes, berating the judge repeatedly while vilifying with defamatory remarks individual students who are now plaintiff’s against his fraud. This rant of course had nothing at all to do with his qualifications for president, but certainly revealed his ever-apparent character flaw- that of being such a shallow person that he must rail against anyone who dares challenge him in the least. Working himself almost into a lather, Trump berated his legal adversaries for so long that some people began to leave. Megalomaniacs hate questions and therefore the press. This is especially true of Trump who spoke only in the general language of his own greatness and promises of his greatness washing off vicariously to his rabid minions. This of course means he did not use any facts, and certainly there were very few presented on stage. Throughout his speech he called out the press, calling them, “slime,” and vilifying all in attendance to the crowd that was already anxious to turn their newly acquired venom on someone. Here Trump calls out the collective media. Turning their attention dutifully, Trump’s supporters chastise the Press for asking any questions. It should be noted, that unlike normal campaign stops of a bygone era, there was absolutely no opportunity-except for the lapdog pool reporters- to ask the presumptive nominee anything. Trump supporters seem to wallow in their own ignorance and that of their candidate. Many stated that Trump’s lack of details was very good and showed that” he’s not a normal politician.” Touche. All good things must end, so Trump supporters- high on hate-speech and obsession- head for the exit. As one journalist put it, ” When all this testosterone hit the street outside, it’s not gonna be good.” He would soon prove to be correct. Hatred needs to be fed. Leaving the press exit this was the first thing in site. Cops. Lots and lots of Cops. Indeed, over five hundred multi-uniformed cops from San Diego City, San Diego County the California Highway Patrol and National Guard assembled in many different clusters of very heavily armed police spread out for a two mile radius. Crude. But, judging by today’s speech, accurate. Favorite sign of the day. As referenced, hatred needs to be fed. Trump supporters could have gone home, but many stayed salivating at a chance to vent their anger on all those in attendance in the Free Speech Zone. They gather across the street, taunting and screaming racial remarks at the mostly Hispanic crowd on the other side. The Cops did little to stop the Trump rabble from inciting violence even when they began hurling water bottles and objects began raining down from atop the Hard Rock.Soon it would become obvious why.The Cops were there only to put the Free Speech protesters in their place. And that they did, for while the Trump clan was inciting violence some two hundred Cops were busy ringing the perimeter of the Free Speech Zone. They were not protecting anyone. On at least six occasions, despite the growing agitation being caused by Trump supporters who had crossed the street to start bigger trouble, the Cops willfully let dozens more hate-filled Trump supporters cross the street and enter the frey. This only made matter much worse, which seemed the point. The Trump supporters could have gone home. The two sides of the issue. On the left, Trump supporters. On the right, voices of reason. Arrested. Despite the provocation by the Trump supporters none were observed being arrested. 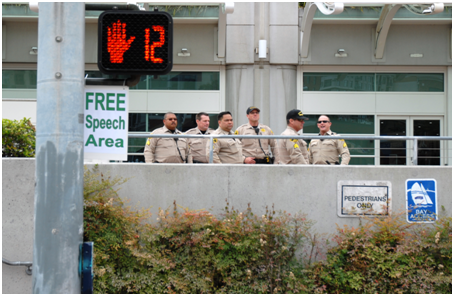 This service seemed exclusive to the Free Speech Zone. Police report thirty-eight arrests. Then.. times up! Democracy for the day is over. Time to go home. But, how? This story will continue with Part Two.